My husband has become a great fan of pumpkin bread since the day he tasted it at his work place. He has been behind me to bake this bread and I was postponing this project until now. This was not too sweet but was just right for us. I am sure this bread is going to be baked quite often at home. I felt the bread tasted better the following day. Blend in the liquid ingredients (pumpkin puree, almond milk, lemon juice and sugar) until the sugar dissolves. In a mixing bowl, sieve the flours, baking powder, baking soda, cinnamon powder and nutmeg powder. Preheat the oven to 350 F and prepare a 9 X 4 loaf pan by greasing it and for ease of removing, line it with a parchment paper. Pour the batter onto the prepared pan and smooth the tops. Sprinkle chopped almonds if preferred. and bake for about an hour. I had to bake for an additional 7 min at 325 F.
If the top browns faster, then make a tent with an aluminium foil to cover the loaf pan. Cool it on a wire rack and slice it after it cools down. Serve as is or spread some some butter and enjoy. Cookies and Milk, anyone?? My kids would be among the first to take up that offer. So for a change I made these cookies loaded with all the healthy ingredients and they were happy to munch away those cookies!! Here is something which we have come to love as an evening snack. For the final day of BM #17, here is an easy breezy healthy, green snack. I am told these taste great in Sambar as well. For Day 2 , week 4 of BM #17, here is the ever popular Red Capsicum Chutney which I have revisited as the picture in the original post looks primitive :). For the last week of BM #17, I have chosen to revisit a few of my older posts which I felt don't have good quality pictures. Needless to say these are some of our family favorites as well. That definitely makes it easy for me to click pictures as many times as I prepare at home, right? I usually make this with leftover phulkas but this time I made with leftover kulchas. Here is the original recipe for Roti Upma. Saute the sliced onions and add the diced tomato. After the tomato becomes a little mushy, add the roti pieces. Give a gentle mix to the mixture and switch off the stove. Squeeze in some lemon juice to taste! Check out the Blogging Marathon page for the other Blogging Marathoners doing BM# 17. Also linking this to Helen's Breakfast Club at 'Breakfast Club - Leftovers'. My little one is very fond of 'Crunchy Puri' as she calls it. So I tried to add in as many flours as my pantry allowed and made these to her delight! I sprinkled a pinch of red chilli powder for a spicier version. Here is a recap of BM#17 .. So check out these cute crisps for Day 3 , week 3 of BM #17. For Day 2, Week 3 of BM #17, here are some bajjis for the rainy day. Now that the kids have vacation, I need to come up with different snacks to keep them 'entertained'. Instead of Palak we could use Malabar spinach (bacchali aaku) as well. I reduced the spiciness for a few made specially for the kids. Here is how I make Palak Bajjis at home. I had made these as part of the Ugadi Festival Thali. Make the Bajji batter (the batter should be slightly thick like Idli batter) with besan, water, ajwain, salt and mirchi powder. Heat oil in a wok/kadai and dip each of the spinach leaves in the batter making sure the batter coats the leaves evenly. Gently slide in the oil and fry until golden brown. Repeat for all the leaves are done. Sending it to Srivalli's Kid's Delight - Evening Snacks. We now enter BM #17 , week 3, Day 1. For the next three days I shall post some delightful kid friendly deep fried snacks. I have this Gujarati neighbor who occasionally drops by to say hello. I was in the midst of preparing a simple dinner for my new neighbors when this lady dropped by. In the few minutes she watched me finish off my cooking, she suggested that I should try making something called Dhebra in Gujarati. It was the first time I heard that name and so I asked her the whats and the hows. She tried telling me the ingredients in Gujarati which I hardly understood and I ended up showing all the flours I had in my pantry and she picked out all of them required. She mixed the dough for me and asked me to proceed following her instructions. I realized that they were a different variety of Nippattu and thanked her for introducing me to this delightful snack and she just shyly shrugged off and ran off on some errand. It was such a nice gesture on her part that I kept thinking about her for quite sometime. In a mixing bowl, add the flours, and the rest of the ingredients except yogurt and water. Mix well and check for the taste. Add in the whipped yogurt and water to knead into a stiff dough (like chapati dough). Pinch a big marble sized dough, roll into a smooth ball, pat into a small thin disc either on a greased plastic sheet or on a parchment paper. Meanwhile, heat oil in a wok, mukudu or kadai and when it is hot enough, slowly peel the disc from the plastic sheet and slide slowly into it. Depending on the size of the wok, you could fry about 6-7 at one time. On a medium flame, let the dhebra turn to slight golden brown color. Use a slotted ladle to remove them onto a paper towel so as to absorb the oil. Repeat the same for the entire dough and serve them with hot tea or cool them before storing them in an airtight container. They stay fresh for over a month. The April edition of Indian Cooking Challenge was cancelled due to unforeseen circumstances. These kulchas were actually part of the April challenge and Srivalli asked us to post it for the month of May instead. In a mixing bowl, sift the flours, baking powder, baking soda and salt. Add in curds and oil and knead a soft dough adding as much water/milk as needed. Divide the dough into 10 equal portions and set aside. In a mixing bowl, add the boiled and grated potato, sauteed onions, powdered pom seeds (anardana powder) salt, mint, coriander leaves, red chilli powder and mix well. Divide the mixture into equal portions. I made about 10 portions and set aside. Flatten each portion of the dough into a small circle and place one portion of the stuffing, fold the edges to cover the stuffing and roll into a ball. On a lightly floured surface, roll the stuffed dough into a 4-5 inch disc of desired thickness. Cook the rolled out kulchas on a hot tawa/griddle until they are cooked on both sides. Spray oil as needed. Continue with the rest of the dough and store the prepared kulchas in an insulated case. Serve with seasoned yogurt or a curry of your choice. Magic Mingle #6 this month has the magic ingredients of All Purpose Flour and Coriander. The options were numerous but I chose to bake some Vegan scones as they are low in fat and they are well appreciated at home. The inspiration for these scones is from here and I am sure I am going to bakes these scones very often as these were an instant hit with the family! In a mixing bowl, sift the all purpose flour, wheat flour and baking powder. Add in the herbs and spices and mix well. Rub in the olive oil too. Add Apple cider vinegar to almond milk and set aside for a couple of minutes. Gradually add the almond milk + vinegar mixture to the flour and gently mix to get a sticky dough. Bake for about 15 min then I broiled on high for a couple minutes to brown the tops. Slide them onto a cooling rack. Apply some butter on the top if you don't mind a non-vegan version (I sprayed some olive oil as I felt the tops were a bit dry). We, adults enjoyed with a dollop of hot sauce while the kids had them with regular ketchup. For this edition of Blog Hop Wednesdays, I have been paired with Suchi of Kitchen Karma. While browsing her space, I found this interesting recipe and thought it would be a good choice for my lunch. It was so good that my husband who hates poha finished the bowl which I had set aside for my dinner. :) The original version doesn't have the ground masala which is solely my addition to suit my taste. Boil all the veggies separately until they are just about cooked and set aside. Grind all the ingredients listed under 'To Grind' and set aside. Wash Poha / Atukulu / beaten rice and drain water and set aside. In a heated wok/kadai, add oil and the rest of the seasoning. After they brown a little, saute the onions until they are translucent. Add the boiled veggies and the ground masala. Saute the mixture for a couple minutes. Add turmeric, salt and garam masala. Add in the washed and drained poha and remove from fire after a minute or so. Squeeze in some lemon juice as required and serve it with raitha of your choice. For the day 3 of this week's edition of BM #17, I made use of the near rotting fruits in my fruit basket. I added in some milk powder to get the 'halwa' feel rather than a 'jam' feel. It was near guilt free as I used the natural sugars of the fruits and used very little ghee as well. Here are two more halwa recipes from the past two days..
Red Pumpkin Halwa and Orange Honey Halwa. Puree the fruits adding milk as needed. Mix in the almond meal and milk powder as well. Pour into an over sized microwave safe container. Microwave it on high for about 12-14 min in 2 min intervals stirring in between. Add in the sugar and ghee. Mix the custard powder in the remaining milk and add it to the simmering mixture in the microwave. Continue microwaving until the halwa comes together as a single mass. Since I didn't add too much ghee, it was sticky but delectable. Remove from the microwave and let it cool. Garnish with roasted nuts of your preference. 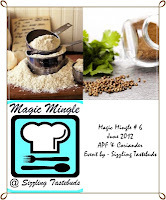 Linking it to Srivalli's 'Microwave Easy Cooking', guest hosted by Priya. For the second day of the second week of BM #17, here is a halwa which is an absolute delight. The sweet fanatic in me cursed myself for having made so little of this halwa. Rest assured I am going to make it as often as there is pumpkin in the refrigerator. The sugar in there is just keeping me at bay! In a heated heavy bottomed pan (I used a non stick pan), add coconut milk and the pumpkin cubes. Let the pumpkin cook. It takes about 15 min. Then gently mash the pumpkin with a ladle. The coconut milk begins to solidify after a few more minutes. Sprinkle the cardamom powder and remove from fire. Garnish with roasted cashews and serve upon cooling. Linking this to CookEatDelicious 's 'CEDD - Pumpkin' hosted by Mireille. The three Day Blogging Marathon # 17 for the second week starts today. I shall be blogging under 'Halwas and Payasams' this week. So look out for some delicious Halwas from my side. In my childhood days, my parents were very strict in not allowing us to go near street food. The reasons ranged from the food is not hygenically prepared to the serving plates are not washed properly (It is true even today but we are no longer restricted but ridiculed by them for sure :)) . So whenever there was a street hawker selling the Mango bars (Mamidi thaandra), I would be salivating sitting in my room as it happens to be my favorite treat. In later years, they were neatly packed and sold as 'Naturo mango bars', which used to be my go-to treat! As it happens I wanted to make those bars at home and was looking for a suitable recipe to follow when I hit upon this orange halwa and was very tempted to find out how it tasted. If you like the mango bars (the recipe for which is for another time), I am sure you will love these sweet-tangy slices of halwa!! In a heavy sauce pan (preferably a non stick pan), on medium flame, simmer orange juice and the dissolved agar agar flakes, stirring continuously for about 10-12 min. Add honey gradually stirring the mixture until it thickens (about 15 min) . Also add the chopped nuts and cardamom powder. Add a few drops of ghee while continuously stirring until it comes together. Don't worry if it still looks gooey. It will toughen up upon cooling. Spread the halwa evenly onto a greased plate and let it set for an hour or so. Make pieces as needed and serve! This will be the last post as part of week 1 of the BM #17. The past two posts and this one have taken me down the memory lane reminding me of some very sweet moments of my childhood. Though the weather played a spoil sport, I enjoyed blogging under the theme. I remember that amma used to fry these minapa vadiyalu every weekend along with Saggubiyyam Vadiyalu and Pelala Vadiyalu to go with Besibelebath. It has been quite some time since I have eaten that combo. Please bear with the picture which shows that the vaidyams are still 'work in progress'. Be sure to check back in a week or so for the updated pictures. Wash and soak Urad dal for 4-5 hrs. Drain and grind to a smooth batter using as little batter as needed. Add in salt, red chili powder and asafoetida and whip the batter. Add a few spoons of water if the batter is too thick. Arrange a plastic sheet in a sunny area and drop the prepared batter by a small spoon making a near circular shape. Let them dry for 2-3 days and make sure both the sides are thoroughly dry before they are stored in an air tight container. For serving just deep fry in oil until they are golden brown and enjoy with food of your choice.